Lawren Harris, often identified as the unofficial leader of the Group of Seven, first visited the Rocky Mountains in 1924. He was initially disappointed: “Nowhere did they measure up to the advertising folders, or to the conception these had formed in my mind’s eye,” he recalled. However, after he “camped and tramped and lived among them,” Harris fell under the thrall of the Rockies. He sensed in them “a power and majesty and a wealth of experience”1 that would continue to fascinate him late into his life. A case in point? Lakes Agnes above Lake Louise, Rocky Mountains, was painted when Harris was 70 years old. By 1955, over 20 years had passed since the Group of Seven ceased exhibiting together. During the intervening decades, the Brantford, Ontario-born Harris had experimented seriously with abstraction and, after a brief period living in New Hampshire and New Mexico, had settled in Vancouver. Similar to Harris’ earlier paintings of the Rockies, such as Lake and Mountains (1928) and Mt. Lefroy (1930),this later workremains rooted within a representational tradition. The mountains, lake, trees and sky are stylized, but have clear models in nature. 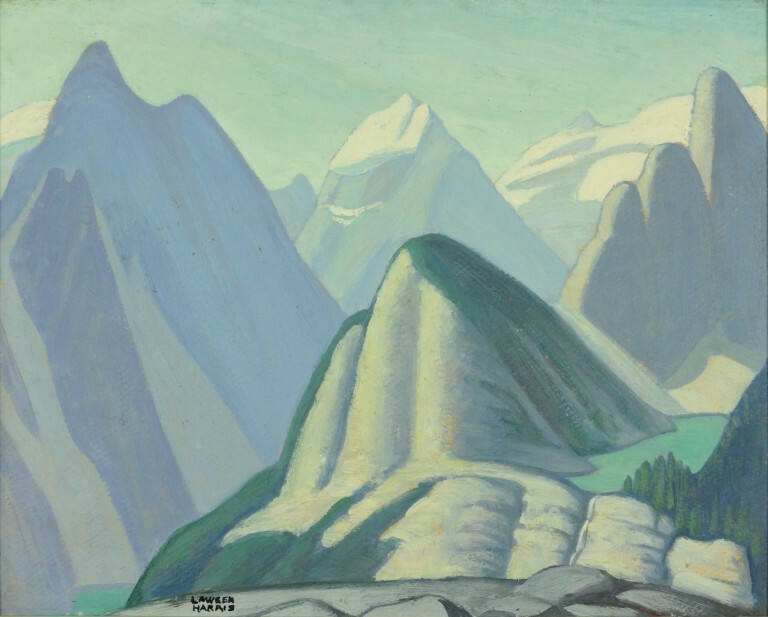 Harris’ composition is at once serene and dynamically crowded, suggesting that the mountains continue on into infinity. At “nature’s summit,”2 viewer and artist may well approach a higher level of spiritual awareness. Harris, a committed Theosophist, would strive to convey his spiritual beliefs through both abstract and representational means until his death in 1970. 1. Bess Harris and R. G. P. Colgrove, eds. Lawren Harris (Toronto: Macmillan, 1969), 62.